This article first appeared in The Edge Financial Daily, on June 5, 2018. Rolex’s gemmology department ensures strict compliance with the four key areas that determine diamond quality: carat, clarity, colour and cut. The Oyster Perpetual Pearlmaster 34’s entire dial is paved with brilliant-cut diamonds. It takes a village to manufacture the foundations of a Rolex watch, and a whole other one to bring the details of its embellishments to full glory. Not only does the Geneva-based watchmaker have its own foundry where all the gold and platinum alloys for its timepieces are cast, crafted and assembled, but every diamond and precious stone to be found on a Rolex watch is selected, inspected and set by traditional jewellers based in its in-house gemmological department on its Chêne-Bourg site. 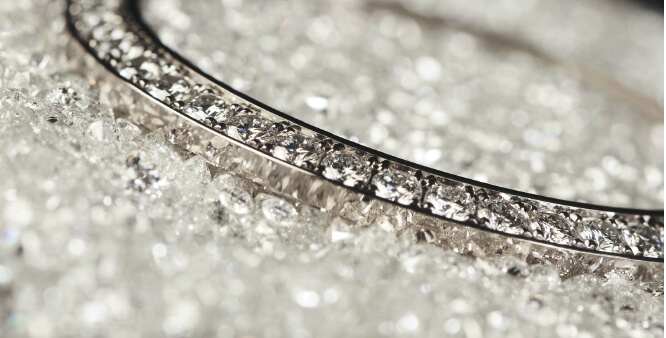 Only the clearest and most translucent of diamonds are picked out in full or brilliant, 8/8, trapeze or baguette cuts. These are selected from within the highest colour grades of the Gemological Institute of America grading system within the range of D to G.
Coloured gemstones — rubies, sapphires and emeralds — undergo a sorting process carried out by hand in the workshops to ensure that each stone on a given watch is perfectly uniform and of the same hue as the rest. After undergoing numerous rounds of advanced testing methods to verify their authenticity, the precious stones are then entrusted to a line-up of gem-setting artisans, who employ four traditional techniques in their craft. While the “bead” setting is the technique most frequently used for creating paved surfaces — where the stones are held in place by three to five small bead-shaped pieces of metal — the “prong” or “claw” setting uses longer metal prongs to further enhance the stones’ visibility. A metal band holds the stone in place in a “closed” setting, which conceals the back of the stone. Finally, the “channel” setting technique is most often used with baguette- or trapeze-cut stones, such that they can be aligned side by side to form a band or circle. 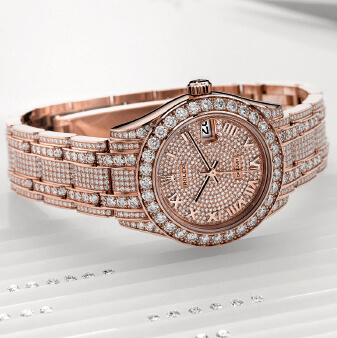 The last is a common feature of Rolex’s gem-set bezels such as that on the Oyster Perpetual Pearlmaster 39, whose entire dial is also paved with brilliant-cut diamonds. It is also at this delicate juncture that the intrinsic beauty of nature meets the art of fine watchmaking, and where high technology is fused with ­traditional know-how. Working with designers and engineers alike, the gem-setters embark on a rigorous process that begins with planning for the placement, down to the nearest micron, of the gold or platinum into which the stones will be set.